Courtesy West Elm Gray is still popular as an interior neutral, but for fall designers are layering it with charcoals, light grays and sometimes a hint of metallic. Courtesy Garnet Hill Textiles, such as Eileen Fisher's tufted wool rug in sand and earth colors, can be added to a room to warm up the cooler season. 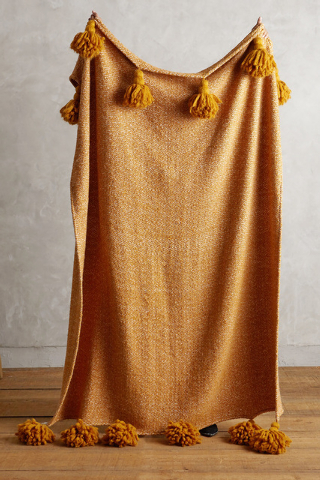 Courtesy Anthropologie Throws in fall colors, like this orange blanket from Anthropolgie, can warm up a room as the temperatures turn colder. Courtesy Anthropologie/Target/H&M Home Varying textures, faux fur and warm textiles like velvet add to coziness. Examples include, from left, the Tassel Trace Pillow from Anthropologie, the Nate Berkus Faux Fur Stool and H&M's Velvet Cushion Cover. Courtesy Bliss Home & Design and Jayson Home Candles are fall standbys for good reason, casting a glow and scenting a room. Metallic can convey a sense of luxury. Examples include, left, the Ringo Candleholder and Vase from Bliss Home & Design; and, right, Prism Vases from Jayson Home. So squirrel away the linen and jute. Pull out the wool, velvet, faux fur and cashmere. These luxurious materials — in drapes, rugs, throws and more — will make a home look warm and elegant. Pairing fall foliage with luxe decorative objects in warm-colored metals is one way to achieve this sophistication. Ambient candlelight is another. Vanessa Holden, West Elm’s creative director, especially likes tone-on-tone vignettes that layer contrast, texture and materials rather than shout for attention with bright colors. n Stools with Mongolian wool or faux-fur tops offer perfect respites for cold feet. At a fraction of the price of higher-end stools, the Nate Berkus Faux Fur Stool, available at Target, can add the fluffy feel of luxury to a living room, sitting room or bedroom. n Candles are fall standbys for good reason: They cast a glow that warms one inside and out. Their scent is important, too, Thompson says. “Scents such as French oak can often bring about feelings of cozying up to a fire,” she says. Try Bliss Home &Design’s Ringo Candleholder and Vase in a centerpiece or on a mantel, with a pillar candle. 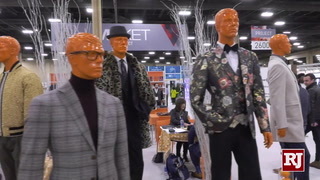 n Thompson likes the tassels on the dark orange leaf-colored Temple Bells Throw from Anthropologie. Fold throws such as this one on the back of a sofa, pile them in baskets, or spread them out on a bed. “I love to drip a throw down the side of a sofa,” says Washington designer Patrick J. Baglino Jr.
n It’s time to put away spring and summer’s brights and neons. Fall and winter call for “texture and shape rather than color and contrast,” Holden says. The cream-on-white Tassel Trace Pillow from Anthropologie is all about neutral, touchable texture. n Holden says that metallics convey a rich sense of luxury during the fall and winter months, whether rich burnished gold, patinaed mirror or copper. And a trio of gold Prism Vases from Jayson Home is just the type of “pretty, warm thing” that Thompson likes to put on a table around the holidays. n Throws, heavy drapes, glittery metals: They all add visual warmth. Baglino suggests adding physical warmth to your home, too, with burning fires in the hearth. Keep the Paxton Copper Bucket from Pottery Barn full of chopped wood and you’ll always be fire-ready. n “In the fall, people want to live with items that hypnotize,” Holden says, including “luxurious textiles like distressed velvet or dip-dyed velvet.” Thompson notes that most of the velvet fabrics today, such as the cotton velvet in H&M’s Velvet Cushion Cover, are more durable and less expensive than traditional silk velvet. n Textiles underfoot can be changed out for the season, too. 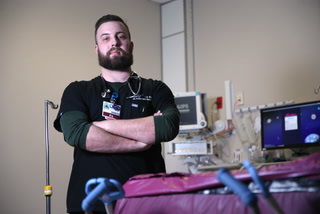 “I go from a flat-weave to something that’s a bit more plush,” Baglino says. “That’s an easy way to change out the look of a room.” In the colors sand and earth, the soft Eileen Fisher Shadow Box tufted wool rug would go well in a living room or bedroom. n Warmth can be conveyed in many ways. If not real firewood, why not a faux bois wood print on a porcelain cup? Edgewood cups, available at www.canoeonline.net, are sized for drinking, but they could also be used decoratively, lined up on a mantel and filled with fall flowers, berry branches or bare branches. “Changing out accessories is the easiest way to transform a room,” Baglino says. n The easiest way to make a home feel cozy is to change out fabrics. Think “velvets, wools, suedes, faux furs, cashmere, quilts,” Thompson says. And think beyond the bedding. Baglino recommends replacing summery linen window panels with elegant velvet ones, such as Pottery Barn’s Washed Velvet Upholstery Drape. n For evening fires, Baglino recommends the simple Glass Standing Firescreen by Modern Design Living. “Your view will be exquisite and unobstructed,” he says. It’s available in three sizes and custom sizes up to 40 inches square. n Gray is still popular as an interior neutral, but instead of pairing it with pops of color, Holden says, designers are layering it with “charcoal, light gray, something with a hint of silver and gold. 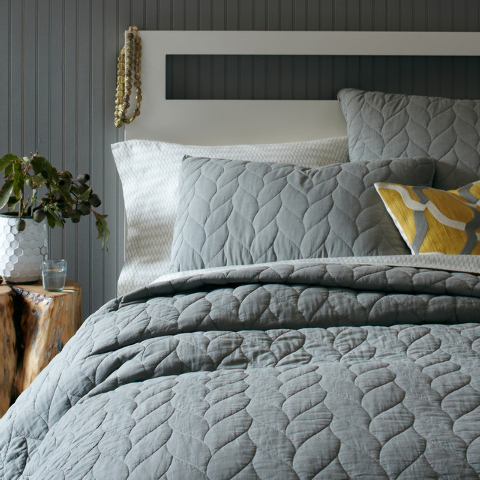 There’s a richness to the tonality of color.” Start with West Elm’s Braided Quilt and Shams in your own layering scheme. n Don’t neglect the outdoors. When guests come over, grab some blankets and get a blaze going in a backyard fire pit. The weather-resistant Large Outdoor Fire Bowl from Plow and Hearth has a large steel base to hold a generous amount of firewood. n A wooden serving bowl is a great go-to for big summer salads. As the weather cools, instead try a festive, low centerpiece arrangement in Crate &Barrel’s acacia-wood Tondo Bowl to dress up weeknight dinners. For more drama, Baglino recommends pairing pheasant feathers with your flowers.